Are you looking for a private shuttle to El Cajon, California? Let San Diego Charter Bus Company take control of your travel plans. Ride on a charter bus along the Pacific Coast, cruise past the Cuyamaca Mountains, and fully immerse yourself in the beauty that San Diego County has to offer. Contact our team at 619-209-7804 to find a bus rental for your upcoming trip! Located in a valley and surrounded by numerous mountain ranges, the quaint city of El Cajon is the perfect spot to visit over the weekend. Its name when translated from its Spanish origin means ‘The Box’, which in itself suggests that it’s the ideal location to be when you want to get away from the outside world. However, if you want to broaden your horizons, cities such as San Diego, La Mesa, Santee and Spring Valley are a hop, skip and jump away. Use San Diego Charter Bus Company as your personal transportation service to tour the major attractions, parks and natural wonders in El Cajon Valley and beyond. Our team will streamline your travel plans, leaving you to spend your days sipping margaritas at Casa de Pico while tanning under the California sun. If you’re looking to visit El Cajon with family, friends or loved ones, book your group transportation with San Diego Charter Bus Company. We offer a wide range of comfortable yet modern charter bus rentals to cater to the needs of every group. We also provide clients with the flexibility to add extra amenities to their bus rental to achieve that ‘wow’ factor. This includes elements such as free WiFi, on-board restrooms, cushioned seats, AV entertainment and more! The team at San Diego Charter Bus Company is available 24/7 at 619-209-7804. Plan ahead and secure a customized bus rental for your trip to El Cajon today! Whether you’re in town to be one with nature or you’re attending your best friend’s wedding, our services can get you where you need to go. Being in the presence of several mountain ranges provides plenty of opportunities to explore lush nature trails, parks and forests. Moreover, the warm Mediterranean climate of El Cajon definitely eases the process of discovering the great outdoors. San Diego Charter Bus Company can shuttle your group back and forth between the various hiking spots in the city. The 18-passenger minibus is usually the best option for outdoor treks, since it is compact and can fit easily in unconventional parking spaces. The climate-controlled interiors of the bus will provide a refreshing environment for you to stretch and relax before you head out. Get dropped off at the Sweetwater River Trail, a National Wildlife Refuge that encompasses the San Miguel Mountain range. Strolling along the trail and the Sweetwater River, provides a reassuring amount of solitude amongst the shrubbery. Other notable options include Steele County Canyon Park and Damon Lane County Park. Follow your heart and get married in the rustic, intimate surroundings of El Cajon. The 56-passenger charter bus can seat your entire wedding party, with ample space for purses, gifts and garments in the overhead cabins. Furthermore, there are several whimsical spots in the city to host your event, with The Water Conservation Garden being one of the more popular locations. This site is home to several intricately crafted gardens, adorned with native plants and vegetables. Unsurprisingly, the picturesque backdrop is a favorite for locals and tourists alike. Don’t forget to check out Vineyard Hacienda and the Hazy Meadow Ranch & Carriage as potential wedding event spaces! El Cajon is home to many charming local attractions that draw the attention of the public eye. If you’re a tourist group visiting from out-of-state, there are several places to see that maintain the charismatic ambiance of the city. Reserve a 20- or 25-passenger charter bus to fit all your family and friends. The free WiFi and power outlets will guarantee that everyone will be able to document their travels as they drive along the valley roads. Take a tour of interactive venues such as the Sycuan Casino Resort and the Heritage of the Americas Museum. The former being a popular spot for live music, gambling and dancing, and the latter being a way to learn more about the natural history of the world. Ready to book your trip to El Cajon? 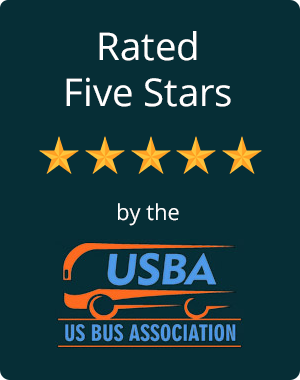 The team at San Diego Charter Bus Company is here to navigate you through the ins and outs of the bus rental process. Apart from El Cajon, our transportation service offers trips in other regions within San Diego, such as Encinitas, Chula Vista and National City. Contact a specialist today at 619-209-7804 to find a bus that is affordable, unique and ready to take you to El Cajon!